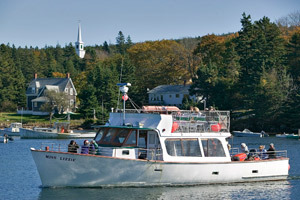 Isle au Haut Boat Services operates year-round passenger, mail and freight service between Stonington and Isle au Haut, and seasonal service to the Duck Harbor Landing of Acadia National Park. We are happy to serve our seasonal residents and daily visitors during the busy summer months, but our mission is also to support Isle au Haut's year-round community during the quiet winter months. For an unbridged island, reliable daily service is a fundamental part of building a sustainable community. Many of the things we take for granted - daily attendance for high school students, visits to the doctor, visits from friends and family, delivery of parcels - take on new dimensions when the ferry service is the only link from island to mainland. In operation for nearly 60 years, we became a not-for-profit company in 2002 and have received 501 (c)(3) recognition from the US Internal Revenue Service. In 2018 we covered about 84% of our operating expenses from passenger, mail and freight income. 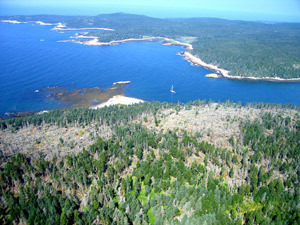 The remainder is funded by the Town of Isle au Haut, by the US Department of Transportation, by the National Park Service and by tax deductible contributions from private donors.